Calder: Hypermobility features major examples of Alexander Calder’s work—from early motor-driven abstractions to hanging mobiles. 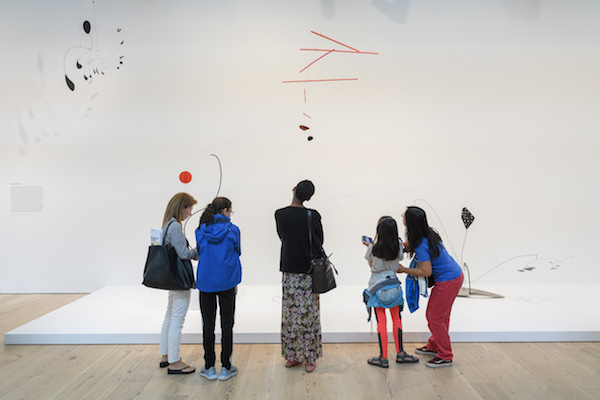 Visit the exhibition at scheduled times to see select works in motion, join us for Calder on Film, or take a course to learn more about the artist in the context of performance art. You still have time to catch our summer exhibitions! Experience the excitement, complexity, and activist nature of Hélio Oiticica’s art in Hélio Oiticica: To Organize Delirium, which The New Yorker calls “an overdue revelation.” And don’t miss Willa Nasatir, which features the emerging artist’s hand-manipulated photographs. Both exhibitions close on October 1.